Разстояние до летището 27,9 км. Имате въпрос към Recep Bungalow? Независимо дали сте турист или пътувате по бизнес, Recep Bungalow е перфектен избор за настаняване в Бали. Разположен само на 0.5 km от центъра на града и на 30 km от летището, този 1-звезден хотел привлича всяка година множество посетители . С удобното си местоположение хотелът предлага лесен достъп до всички градски забележителности, които задължително трябва да се видят. Recep Bungalow прави всичко възможно гостите да се почувстват удобно. Затова хотелът предоставя най-добрите услуги и удобства. Хотелът е оборудван със съоръжения като безплатен WiFi достъп във всички стаи, 24-часова охрана, ежедневно почистване, пощенски услуги, индивидуално настаняване/напускане. Насладете се на висококачествените удобства по време на престоя си тук. В някои стаи са на разположение достъп до интернет (безжичен), стаи за непушачи, бюро, балкон/тераса, вентилатор, които ще помогнат на гостите да релаксират след дългия ден. Хотелът предоставя най-добрите съоръжения включващи масаж, градина, които ще Ви помогнат да отпочинете след активен ден прекаран в града. Насладете се на несравнимото качество на услугите и престижното местоположение на Recep Bungalow. Отседнахме 5 вечер/и в март 2019 г. Great place, nice garden, beautiful pool ! The room is great with the kitchen !! But the neighbourhood is very noisy... some nights were unbearable, so sad cos the place is perfect ! Very nice hostess and staff, big spacious room with kitchen and balcony. Room cleaned every day. Wifi was functional with a few hiccups but pretty mediocre speed (around 2-3Mbps usually). My only issue was that they were burning stuff on the property daily and the smoke inevitably wofted into my room because the bungalows have semi open-air sections with screens so there's no way to keep the air out. When they were burning a lot it smelled like a campfire in my room for a couple hours afterwards and the particulates in the air bothered me somewhat. If I had known it has kitchen, i would bring something for cooking. It has big kitchen, big bath and big terrace. The room also big enough but the bed looked not so clean and it was not spring bed. Breakfast is eggs and a slice of bread with fruits. It was nice. I brought my dog. They have hot water for shower. No air con but it was not so hot. we use a fan. The hotel seemed renovation when I stayed there. The location is central enough to walk into town but also far away enough to remain quiet, away from all of the hustle and bustle. The rooms are quite large and you are treated like family. I will definitely stay here again on my next visit to Ubud. I stayed only one night in Recep Bungalow, and I appreciate that I had no problems checking in despite my flight arriving late and getting to the property past 1am. I was ushered to a very big room on the 2nd floor, and when morning came the view from the balcony was awesome. Breakfast was served right on the terrace. Recep is also walking distance to many great restaurants, and if you go up the Penastanan steps, you can head for Intuitive Flow Yoga, Yellow Flower Cafe, or walk all the way to Campuhan Ridge and the Antonio Blanco Museum. The staff was nice and helpful, my only issue was that the room kind of smelled weird (like cat poop) when I arrived but I was too exhausted to complain. By morning the smell seemed to be gone. Отседнахме 7 вечер/и в юни 2017 г.
I very much enjoyed staying in this well-located guesthouse with Rusmini and her family. Everyone was so nice, breakfast was perfect, coffee was strong, and the garden with the resident rooster and cute cats was a delight. My room had its own outdoor space which was great. It's a short-cut walk across the path to Intuitive Flow Yoga. Recep is also right near several restaurants including a really great Jamaican restaurant, Jambali. that serves fresh traditional dishes as well as vegetarian options. I went back there every night. I'm sure I'll be back to Recep some time. Отседнахме 3 вечер/и в октомври 2017 г. We really enjoyed but our time at Recep. The family are really nice and there's the cutest little children who love to chat to you in the mornings. There's also a fair few pets on Thai property which really made it efeel like a true homestay. Room was a decent size and the balcony was an added bonus. Close to the town centre by far enough away that you still get some peace and quiet. Would recommend hiring a moped as it's definitely the best way to explore Ubud and the surround areas. Отседнахме 2 вечер/и в септември 2017 г. Very nice people, if we needed anything (tours, early breakfast) it was arranged very fast and for a good price! It's a great spot to begin touring the surroundings of ubud by scooter (that you can rent from recep), it's a 20min walk to center. Отседнахме една вечер в септември 2017 г.
I've stayed in a LOT of guesthouses across Bali and Indonesia in general, and this one stands out as probably the best value I've found here! The local family who runs it are so lovely and welcoming and the bungalows are set in a lush garden with tons of trees, plants, and various birds wandering around. I stayed in the standard A-building Bungalow, which is two floors and has its own kitchen and living room, strong AC, hot water, and upper and lower patios. 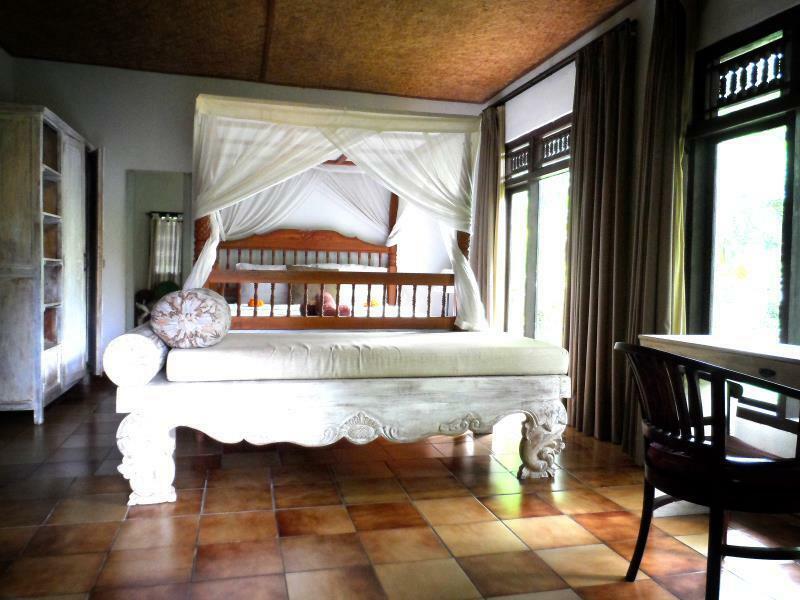 Great location in Penestanan, walking distance to central Ubud but away from the noise. Отседнахме 5 вечер/и в август 2017 г. This is a delightful, peaceful place to stay with a large garden area, lots of birds and a great opportunity to see Balinese family life in action. 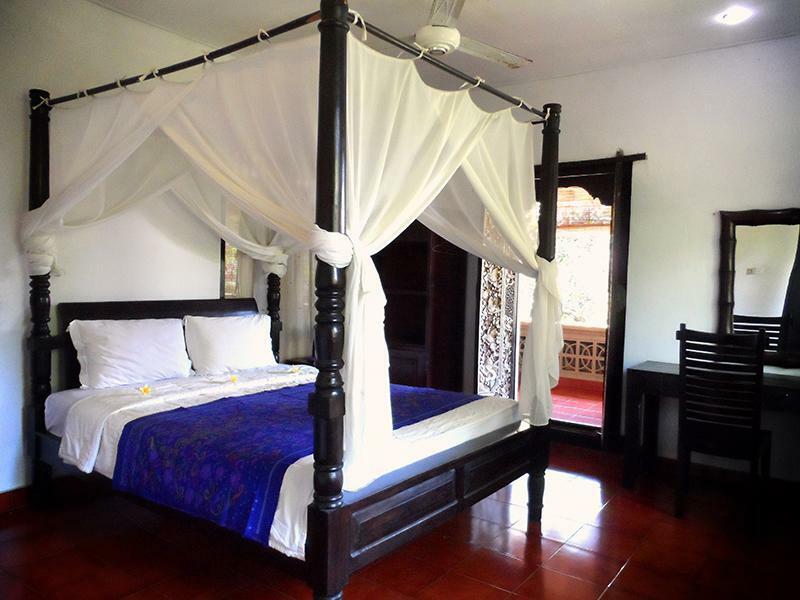 The bungalows are big, breezy and quiet with big verandah sand balconies. 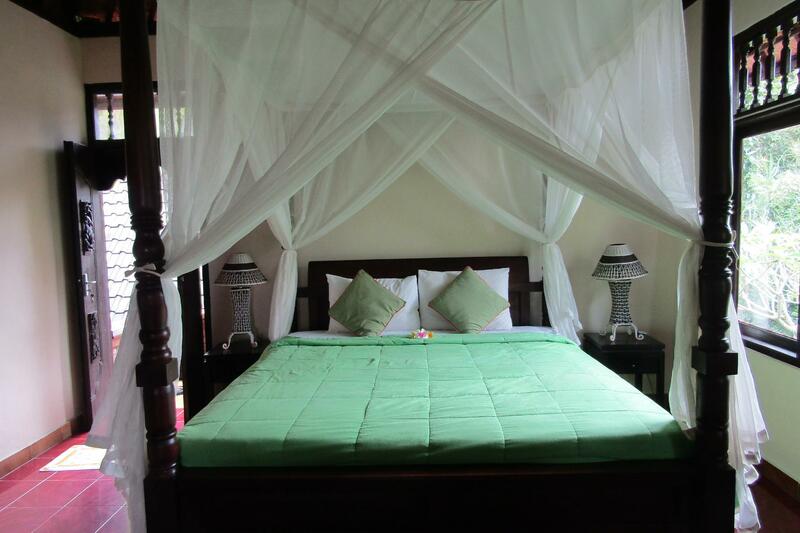 The bed is very comfortable and equipped with mosquito net and I didn't have any problems with mosquitoes. There is also a large kitchen with cooking equipment if you want to cook. Nice, big bathroom with hot water & good water pressure. The host and staff were all delightful and very obliging and helpful. Breakfast was also included. Location is convenient to walk to Ubud town & very close to Campuhan ridge walk but far enough away to escape all the hustle bustle of Ubud central. A good size Breakfast also included. Great value and location!! Отседнахме 4 вечер/и в юли 2017 г.
Recep is a family run guesthouse that consists of a series of small apartments set in a very pretty garden, and is very well located, (outside of the chaos that is Ubud), in Penestanan, on an arterial road with many little shops and restaurants, including Jambali (Jamaican), Alchemy, Arak (coffee) and Prima's Warung (vegetarian). Rusmini and Jimmy run Recep, and they are lovely people, always willing to help and solve problems. You get breakfast brought to your room in the morning, which includes a mug of delicious and strong Bali coffee. The rooms all have balconies or terraces that look onto the garden - a great place to sit and eat or read. They have roosters and cats that wander the garden in the morning. I especially appreciated that Rusmini made me a special breakfast every morning to conform to my restricted paleo diet. They can arrange an airport transfer, and I also hired Jimmy to drive me to see sights. It's a short walk by footpath to Intuitive Flow yoga studio, as well as to Cantika spa. You can also walk in to Ubud, or to the supermarket. There is a motorbike 'taxi' stand across the street. I have stayed in 3 different apartments here. They all have a little desk and wi-fi. Some of the apartments have kitchens, and some have steep stairs. Отседнахме 5 вечер/и в юни 2017 г. Stunning gardens, private villas were sweet and comfortable, fantastic location walkable to many sights, local hosts were kind, helpful and informative. Breakfast amazing. Truly superb and my teens and I had a hard time leaving. We'll be back. Beautiful homestay with a lovely garden. The family & staff were very friendly and helpful. Family dog Mimi was friendly & cute too. Very comfortable stay. Отседнахме 6 вечер/и в октомври 2016 г.
I was in Ubud for a little relax and had to pick up my passport. It was delayed and I think i ended up staying at this lovely homestay for a few weeks. 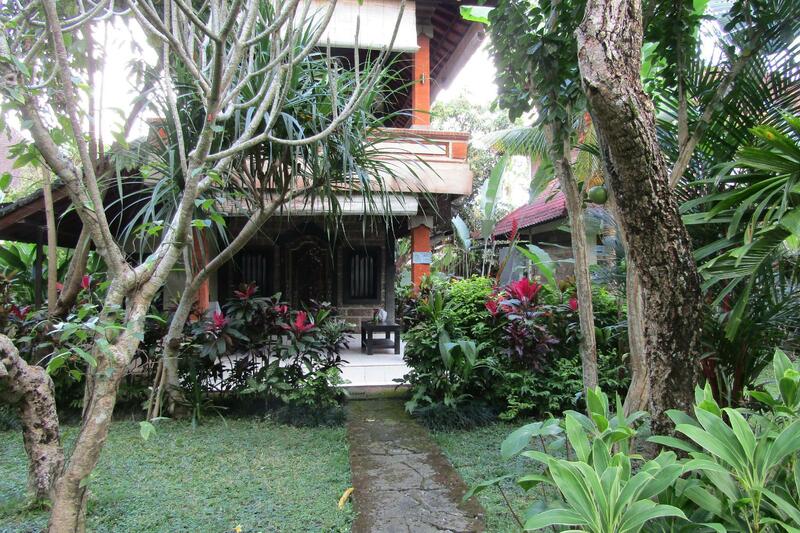 Time just flies in Bali and this nice little family run homestay was perfect. I have stayed a quite a few homestays and this one is the best. The room was spacious and had so many nice details and the added bonus of a kitchen and nice big balcony and gardens. It's a really quiet place and I really enjoyed my time there. Ubud can get a bit hectic and the area where Recep Bungalow is located in a real secret gem of a place - so don't tell everyone. If I have family or friends visiting I would recommend they stay here! 4 пътешественици намират този отзив за полезен. А, Вие? I booked the apartment here for two days. We arrived here at midnight and the woman at reception told us that there was some error on agoda website and their hotel is actually full. But she arranged us a room at Dewa Bharata hotel just across the road, more expensive than room that we booked at Recep, and we haven't been asked to pay the difference. So, we haven't seen the hotel inside but the attitude to clients is for 5 stars with no doubt. Отседнахме 3 вечер/и в май 2017 г.
Aus drei gebuchten Nächten wurden letztendlich acht Nächte. Die Unterkunft ist super schön, Bad mit Badewanne und Regendusche, leckeres Frühstück auf der Terrasse und die wohl nettesten Gastgeber in Ubud! Roller können ausgeliehen werden, Rosmini gibt einen gute Empfehlung bezüglich Touren, Yoga und Restaurants. Yogastudio Intuitive Flow und das Yellow Cafe in 5 Minuten zu Fuß erreichbar.